Opening a store in that lovely part of the town is every retailer’s dream. Taking a place on lease has its own set of advantages. You can add structures/ display units and do certain modifications which a typical residential agreement would never allow in a million years. How To Make A Commercial Shop/Store Lease? When you wish to open a store of some kind in a shopping complex, isolated building or any spot of your choice, you will need to prepare a store lease. The lease will be signed between the owner of the business and the landlord. Such leases are governed by the Rent Control Act and are binding. Hence, proceeding without a contract is like leaving a ticking legal bomb. Any individual above the age of 18 can enter into a commercial store lease. Companies and business too can be the lessee in a store lease. Any person wishing to open a store in a place available for rent can enter into a store lease. Following are the steps you need to take to ensure that your lease is legally valid. Prepare and verify the contents of the contract. Print the verified document on stamp paper of recommended value. The stamp duty may change from state to state. Place the names and signatures of landlord, tenant and witnesses in designated places. Stamp paper is generally purchased by the tenant and who will also retain the original copy of the lease. The landlord gets to keep a duplicate copy. Registration is mandatory for any rental agreement for a duration of more than 11 months. Some states mandate the registration even when the lease span is less than eleven months. Like every other legal document, store leases also require that the names and addresses of Tenant, Landlord, property being leased out and other valid entities to be clearly mentioned. The term of the lease along with the interval and amount of payment too must be mentioned. The date on which the contract begins, conditions of termination of contract and factors to be considered while renewing the contract have to be spelled out too. Store leases are different from rental deeds in both the format and the clauses included in it. Store leases often allow the Tenant to build structures or incorporate changes to the existing structure so that the business flourishes. Display structures, cabins, wall installments etc may be added. Because the addition/ removal of structures and renovation of the building is vital to the business, it needs to be clause in the store lease. To make a store lease legally valid, the prepared contract has to be printed on stamp paper of recommended value, signatures of tenant, landlord and witnesses placed in designated places and registered at the sub registrar office. Keep in mind that leases that are for a period of more than a year must compulsorily be registered. 1. What are the factors to be considered while picking a place to set up a shop? A lot of factors go into deciding a matter like this. As the very location of the shop and its construction is vital to your business, pay attention to the following factors while looking for that perfect place. Quality of the frontage. Enough windows, right beside the street etc are factors are make sure that your shop is seen and that customers walk in. Enough space. The place should be big enough to have room to allow customers to walk around. Keep in mind that if you plan to put in structures on walls or sides, the space could diminish considerably. Parking space for you and your customers and sometimes heavy vehicles to bring in goods. 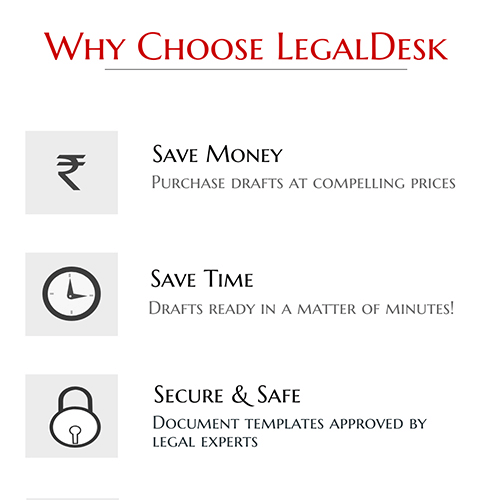 LegalDesk offers legal expert verified, ready-to-use commercial store leases. This means that you don’t have to spend days getting a lawyer to draft a deed for you. In which case there is the added minus that the place you liked would be gone by the time your deed is ready. Skip all the hassles by just filling in your details in our pre-drafted form. We will print the deed on stamp paper and deliver it to you and you’re done! Good luck with the shop!